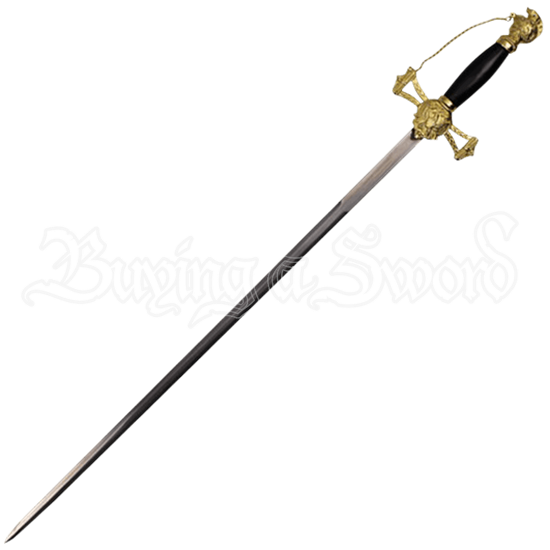 Inspired by the noble Templars of the medieval era, the Saint John Gold and Black Crusader Small Sword is a beautifully detailed decorative weapon. Made of 440 stainless steel, the narrow blade is followed by a black and golden tone hilt. The flared, cut-out arms of the crossguard grant this replica sword the silhouette of a cross, and an eagle with its wings spread details its central emblem. The black grip has a rounded shape to help it fit comfortably in the hold of its wielder. Intricately detailed, the pommel bares a likeness to a medieval helmet, again finished in a bright golden color. A matching gold tone chain connects this pommel to one arm of the crossguard. Included with this ornate Crusader sword is a matching steel scabbard, also decorated with bright golden colored detail. An ornate golden fitting features a carrying ring to each side and a red cross at its front, closely followed by another fitting that supports the third carrying ring. The rounded endcap of the swords scabbard also displays a golden border. 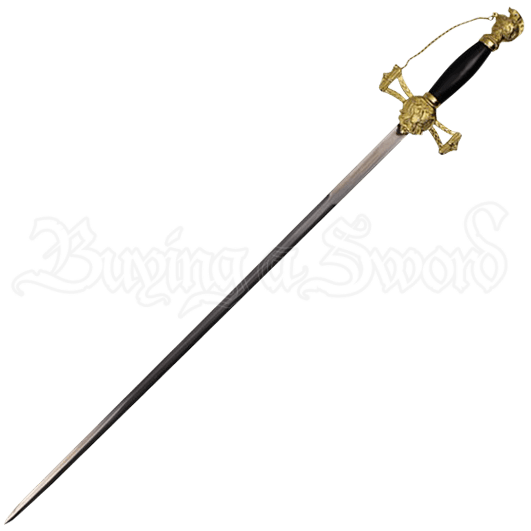 A gorgeous display of chivalrous symbolism and quality craftsmanship, the Saint John Gold and Black Crusader Small Sword makes a fantastic addition to themed home decor set-ups or weapon collections.